Human Blind Spot | Visionary Eyecare's Blog: "The Eye Journal"
Everyone has a BLIND SPOT in their vision of each eye. Take this FUN test to check it out for yourself !! Look at graphic of the cross and the circle at the top of this post. Sit at your computer with your nose pointing in between the cross and the black circle. Cover your LEFT eye and stare at the cross with your RIGHT eye. Now SLOWLY move towards the computer screen while still staring at the cross with your RIGHT eye. At somewhere around 10-14 inches from the computer screen – the black circle will disappear and the area where the black circle was…will now be all white – this is your BLIND SPOT. If you move closer to the screen or farther away – the circle will re-appear. At just the right distance – the circle will disappear. Now try the OTHER eye…but this time cover your RIGHT eye and look at the CIRCLE with your LEFT eye…..move closer and you will see that the CROSS now disappears!! Your eye has an inner lining which is made of a sheet of nerves. This sheet of nerves is responsible for your vision and what you see and it is called the RETINA. There is a “hole” in the sheet where the Optic Nerve enters the eye. This area is called the Optic Nerve Head. Photoreceptors are cells in the retina that detect light and allow you to perceive “vision”. On the optic nerve head there are NO photoreceptors. Thus, there is no light or vision detected at this spot in the retina. This is your “Blind Spot”. Every eye has a blind spot….your blind spot in your right eye is slightly on your right and your blind spot in your left eye is slightly on your left. 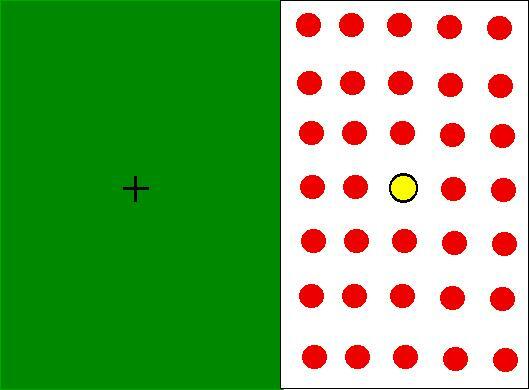 Your brain automatically “fills in” the blind spot area for you…..
Now try it AGAIN with the above green and yellow graphic….but this time you will notice that when you move to just the right distance , the circle will disappear and your brain will fill in your blind spot WITH YELLOW when you are looking with your right eye (left eye covered)….and your brain will fill in your blind spot WITH GREEN when you are looking with your left eye (right eye covered)!! Your brain automatically matches the surrounding colors when it “fills in” visual information for you. Your brain can even “fill in” missing information for you…..in the above graphic, you’ll notice that when you cover your left eye and look at the cross with your right eye – the brain will “fill in” your blind spot (the area where the circle is). You will see that your brain fills in the line for you. Keep looking at the cross – don’t look back at the circle – or you will will see the circle again. 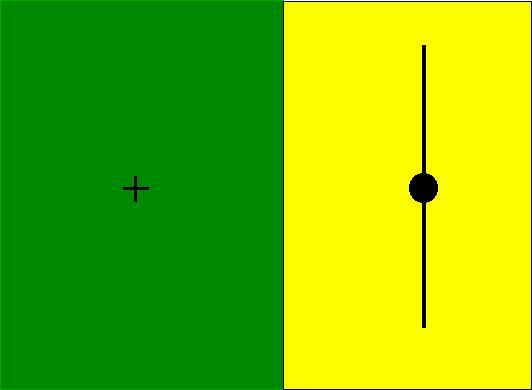 Try it AGAIN with the above graphic while looking at the cross with your right eye (cover your left eye) – your brain will put a red circle where your blindspot is….it is “filling in” the “missing information” ! !